Perhaps you’ve heard of the dreaded sleep regression. Or maybe you’ve heard, “the 4 month sleep regression is a myth!” and you want to punch that person in the face because your experience says otherwise and you are TIRED. Note: The Evidence-Based Mommy’s official stance is against punching people in the face. Even when you really want to. Regardless, something like this has happened to you: You and your child had gotten into a predictable sleep routine. Maybe he was sleeping all night, maybe he wasn’t (and that’s okay! No, really. ), but you at least knew what to expect. Then all of the sudden, his sleep drastically changes for the worse. You spend a few hours just trying to get this kid to go to bed. He’s waking up, fussing, multiple times in the middle of the night, and it’s really hard to get him to go back to sleep. Or he’s waking up in the middle of the night and singing and chatting and it just makes you want to stab your eyes out! (Note: The Evidence-Based Mommy does not condone stabbing your own eyes, or anyone else’s eyes, out). Why do sleep regressions happen? What do you do about them? How do you survive, and when will it just end? Get your answers here! A sleep regression is simply when your child’s sleep pattern changes, usually for the worse. It’s not related to being sick or teething, and you can’t see a real “reason” for the change. Or your baby may wake in the middle of the night and stay awake for an hour (so infuriating!). Usually when this behavior is part of a sleep regression, your baby isn’t fussy, she’s actually happy. She may start babbling or even try to walk around in her crib or in your bed! Sometimes sleep regressions involve your child waking up early instead. She may wake up at 4:30 every morning for a week or two. And once she’s up, nothing will get her back to sleep. I wouldn’t go so far as to say a sleep regression is a myth. I would say, however, the phrase sleep regression is a misnomer. Believe it or not, your four month old isn’t trying to ruin your life all of the sudden. She is going through a mental or physical growth spurt, and it’s disrupting her sleep. The sleep regression isn't a myth, but it is a misnomer. Learn more and find out how to cope. Let me explain: Have you ever gotten a new job or started a new hobby that really excites you? Or even just been looking forward to an event, like your wedding or a vacation? Aren’t you so excited sometimes that you just can’t sleep, no matter how hard you try? That’s what’s happening with your baby. The new things she is learning to do are just so exciting that she can’t sleep. Understandable, but really frustrating for you. Because these mental and physical leaps in children are fairly predictable, you can also predict when sleep regressions are likely to happen. The first sleep regression (and the one that takes parents by surprise the most) is the four month sleep regression. 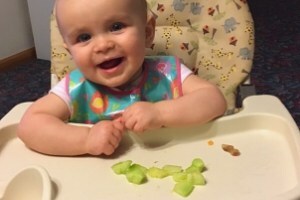 At this age, your child is becoming more aware of the world around him (that’s why he’s suddenly becoming much less focused when you’re trying to feed him!). All this new information and new stimulus makes it a lot harder for your little one to sleep. 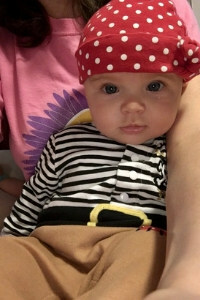 Ahoy there, mateys! I’m here to steal yer sleep. I’ll be honest, the 4 month sleep regression hits pretty hard. Your baby might be up seemingly all night for a week or two. But he eventually settles down into a new routine. Have you been breastfeeding, but in the back of your mind you’re still worried whether your baby is eating enough? Or are you afraid that the real reason he’s not sleeping is that he’s not getting enough to eat (which, rest assured, is likely not the case)? Then get my breastfeeding checklist that tells you EXACTLY how to be confident in continuing your nursing relationship! Once again, changes in your child’s development can cause sleep disruption. Some babies drop from three naps to two during this stage. This makes bedtime hard, because you either end up with a really late third nap and then a kid who never wants to go down for the night, or you only have two naps and a fussy baby who needs to go to sleep by like 5:30. But then he wakes up early because he went to sleep early and the roller coaster starts all over again. What causes the six month regression? Plenty of things! For one, your child is becoming more sociable. He wants to babble, smile, and play with everyone he meets. He may even be starting to say his first word or two! And after three kids, I’ve noticed that major upticks in verbal development are always accompanied by sleep regressions. Plus, your child may be starting solid foods, starting to roll over, or plenty of other new skills. These developments can add up to staying up all night. Yep, you read that right. This one is called the 8-10 month sleep regression or the 8, 9, and 10 month sleep regression. It can last anywhere from 3 to 6 weeks. But on the other hand, there’s so many exciting things about this stage! I’ll be honest, I think babies are at optimal cuteness at nine months. 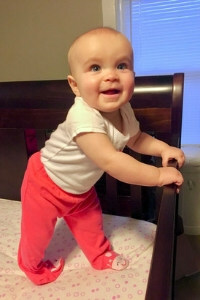 Your child is learning to crawl, maybe to walk (! ), and continuing to pick up new words. Unfortunately, the price you pay for this explosive development is a lack of sleep. You may wake in the middle of the night to hear your baby singing. Or she may be up on all fours, rocking back in forth (preparation for crawling!). Or you may even find her in her crib to see that she’s pulled herself up to stand at the side! Even though the 8-10 month sleep regression feels relentless, especially when you’re in the middle of it, it won’t last forever. Wait, didn’t we just get through a different sleep regression? Fortunately, the 12 month sleep regression is only a week or two long. It’s related to continued development like picking up a word or two, starting to walk, and other fun new skills. Many babies drop from two naps to one during this time. 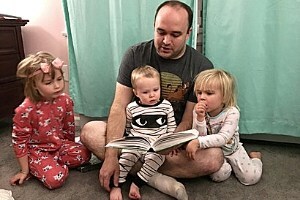 This change will also affect their bedtime for the night, which may in turn cause them to wake earlier in the morning. 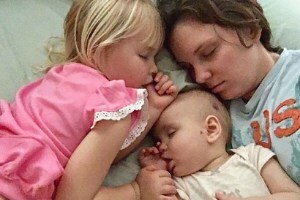 The eighteen month sleep regression may be the hardest one (sorry). Your child is a full blown toddler, and she is ready to assert what authority she has on the world. That authority is limited, but you know what she can control? Refusing to go to sleep. Yep, your feisty little one wants to have some power. A normal and healthy need for toddlers, but one that makes nap time and bed time really difficult. 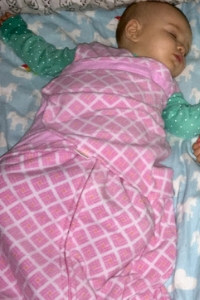 It’s likely you’ll go through a week or two of her yelling, screaming, and fighting bed time with everything she’s got. Find ways to side-step power struggles during the day, and hopefully your little one will be a bit more willing to comply with bedtime. We just went through this sleep regression with Budrow Wilson (hence the inspiration to write this post). And having just gone through it, it’s really fresh in my memory. Budrow is gaining new words and little phrases every day. He’s starting to respond more to my questions with yeses and noes, and he’s really developing a sense of self, of likes and dislikes. If he can’t retrieve an object he wants, he tells me “Stuck!” to ask for help. And bedtime is another thing he just doesn’t want. And he’s willing to let me know it. 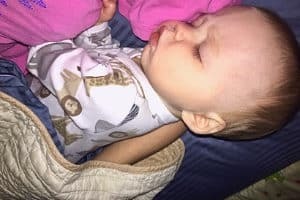 The sleep regression was so frustrating too, because I had just finally gotten him to sleep through the night about a month before, and then this happens. He slept all night last night in his own bed (win!). There’s hope for you too! I suspect this is what you really want to know from this article. But I’ll be honest, you may be disappointed by (mad at?) my answer. Hear me out though. Usually, when we’re so desperate for answers, we want someone to tell us how to “fix” our child. We hope we can sleep train the behavior out of them, or give them a tablet that will fix them, or something to make it just stop. But with kids, that’s just not how it works. So often we think we need to fix our kids, but what we actually need is to adjust our expectations. 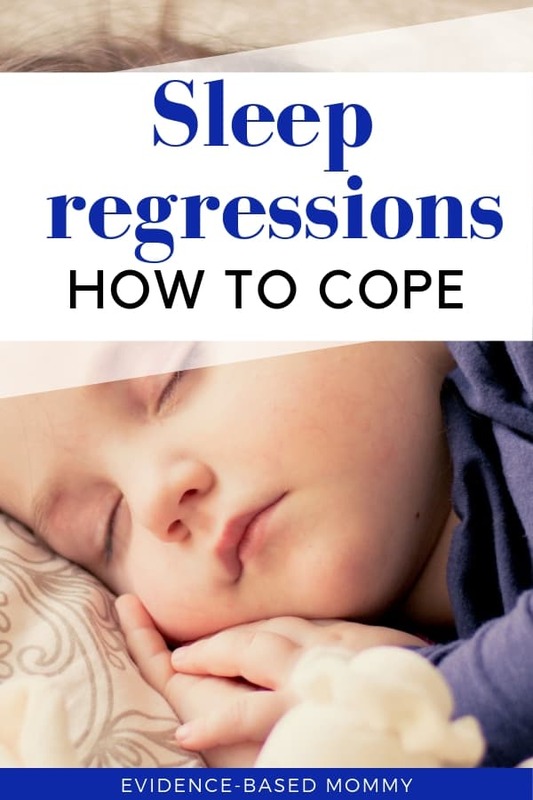 Instead of lying to you (which I honestly think would get me more popularity points) about how to end sleep regressions, I’m going to tell you four ways to cope so you can be your best in spite of them. 1. Stop calling it a sleep regression. 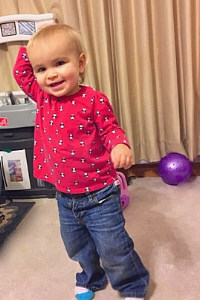 Instead of saying, “My baby is going through a sleep regression,” say, “My baby is going through a growth spurt.” See how that changes things? Be mindful of all the exciting change he’s going through. Even when Budrow wasn’t sleeping last week, my husband and I commented on all the new words he was starting to say. This label change from “sleep regression” to “growth spurt” may seem pointless, but the reframe makes a huge difference in your attitude. So remember, this isn’t a “regression.” Your child isn’t going backwards. He’s transitioning to newer and bigger things. 2. Shut out the negativity. When you’re exhausted, people notice. And lots of people will give well-meaning but useless (and even damaging!) advice. You have to make that child do what you tell him. You need to just leave him to cry-it-out. If you don’t teach your child to obey now, he’ll run all over you when he’s older. If you let him sleep with you, you’ll never get that boy out of your bed. Do yourself a favor. Smile and nod, thank them for their input, and promptly forget everything they say. Or if you’re feeling extra feisty, tell them to shove it up their nose. Your choice. 2. Remember you and your partner are a team. Want to know when my husband and I bicker most? It’s so easy to let every little thing your partner does annoy you when you’re tired (like, you know, when your kid is won’t let you sleep). It took my husband and me a few years, but we finally learned that turning against each other during this time simply isn’t productive. We take turns trying to settle the baby. Sometimes, if Budrow will sleep a little with me but still wakes up a lot, my husband and I just sleep separate for a few nights. He can at least get a little sleep then. In fact, when our daughters were a toddler and an infant, we had a month or two where he slept with Leia and I slept with Bella Bean. Ideal? No. But we did what we had to do, and I’m happy to report we now have our own bed to ourselves again (mostly). 3. Just go to bed early. Seriously. After a night or two of poor sleep from your baby, do yourself a favor and just go to bed at eight o’clock. You can expect to be woken up throughout the night, so you may as well prepare. Sleep is going to be more restorative for you than Netflix binging anyways. 4. Remember this won’t last forever. I know you may not believe me right now, but even the longest sleep regressions don’t last forever. Six weeks seems like an eternity when you’re running on zero sleep, but it will get better. I hope you have a new outlook on your child’s development. And if you don’t because you’re just so tired that this isn’t resonating (which I totally get), pin this article for later. Make it through this week or two until your little one cuts you some slack. Go to bed early until it gets better. After that, come back and read this again (seriously!). You’ll receive the message better when you feel better. And then, when the next “sleep regression” comes around (and it will), you’ll be better prepared.